If you and I were face to face over a drink this week and you asked me what I'm up to these days, I might say something like this: Well... I am basically back at the beginning. I left Uganda after 10 years of community development work and now I'm starting something brand new. Over the past few months I've been working on development of a couple of blogs, each targeted at a different audience. I wanted to let folks know more about what and where those writings are, so you can choose which - if any of them - you'd like to follow. My party @ christinaswwworld blog feeds directly into my facebook notes. It is the most personal of my blogs, about my life as a global gypsy and some of the things I've learned. 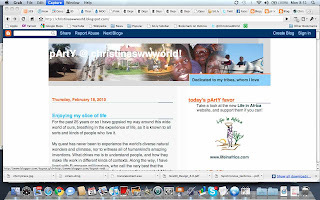 If you are following me on Facebook, what I post at the christinaswwworld blog will appear in your stream automatically. You don't need to leave facebook to read those new entries. I also share this blog with some friends in the entrecard.com blogger community, that I've made while learning about personal blogging from them over the past couple of years. New posts are additionally tweeted out to @ChristinasWorld followers at Twitter, and appear in the twitterfeed that's published at http://Evolutionize.It .